Hey friends! How was your weekend? Did you get any good junk? 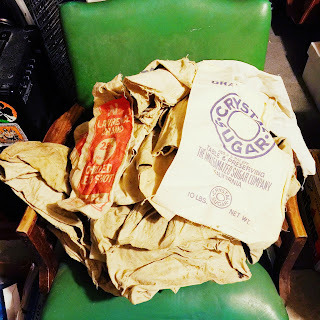 I attended an auction on Saturday and came home with a few things. I would've like to come home with more, but The Beast is still out of commission. Her new parts are taking forever to come in! In the mean time... to help pay for some of her costs... I designed some AWESOME tanks for you to wear on your junkin' adventures. Please check them out! I also helped my best friend move out of the old house she has lived in. The 90 year old woman who lived there before her left a few things behind. 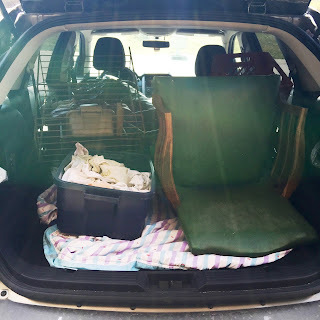 I was able to salvage a midcentury chair and a primitive cabinet. Here's a trunk shot. FYI - I totally forgot to get a picture of the midcentury metal rack (from the auction)... but there is a better picture of the chair below. 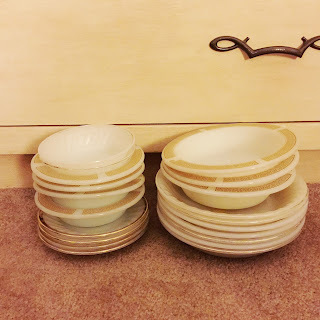 $1 for a pile of Fire King and Anchor Hocking dishes? Yep. 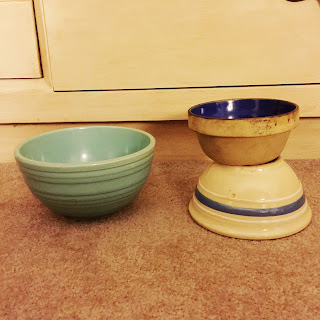 Lots of little stoneware bowls. I'm having trouble deciding if I'll keep the McCoy one or not. 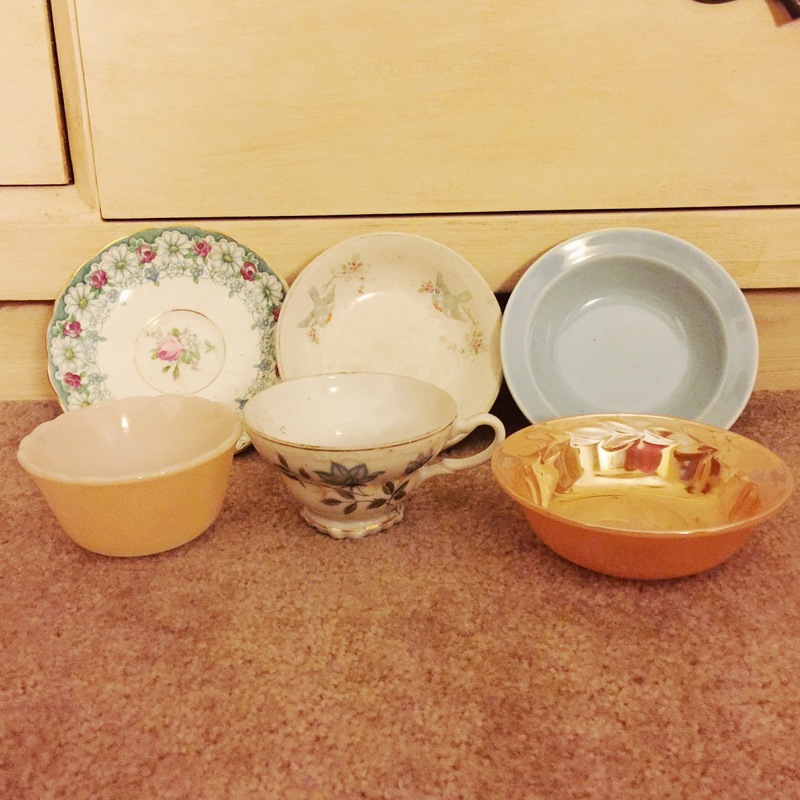 Another pile of dishes for a buck. Yep! I bought this record case for $1 at the auction. 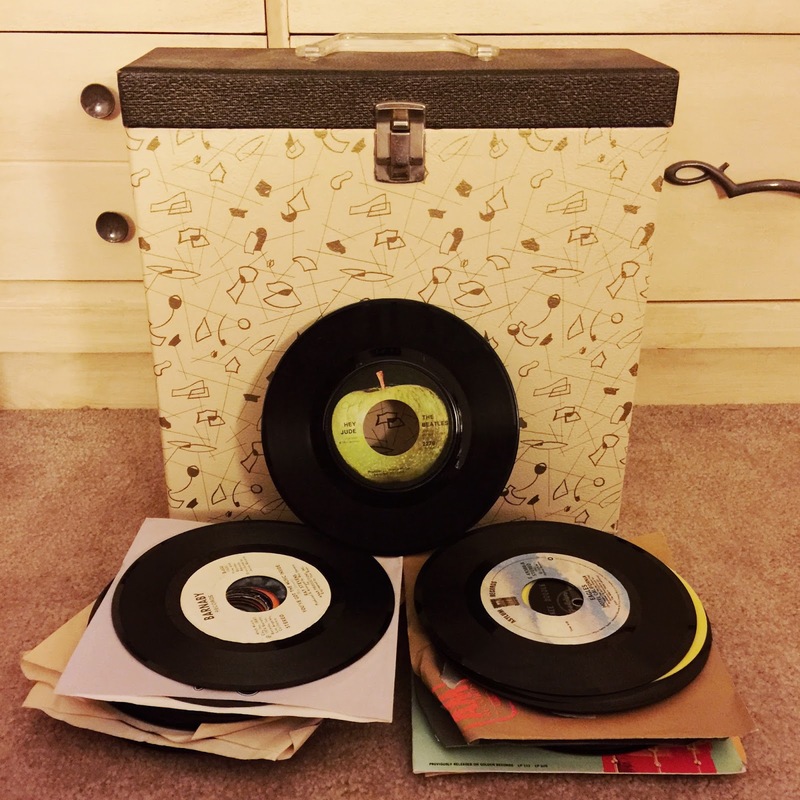 To my surprise... it was full of 45s... including The Beatles - Hey Jude! I have quite the collection of record cases. 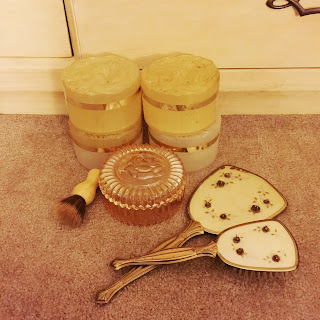 Lots of vanity stuff... 4 vintage Ciara dusting powder boxes. Too bad there's no powder or puffs left... because these boxes go for big money on ebay with the contents! A sweet matching mirror and brush. A carnival glass powder box (or candy dish) and a shaving brush. 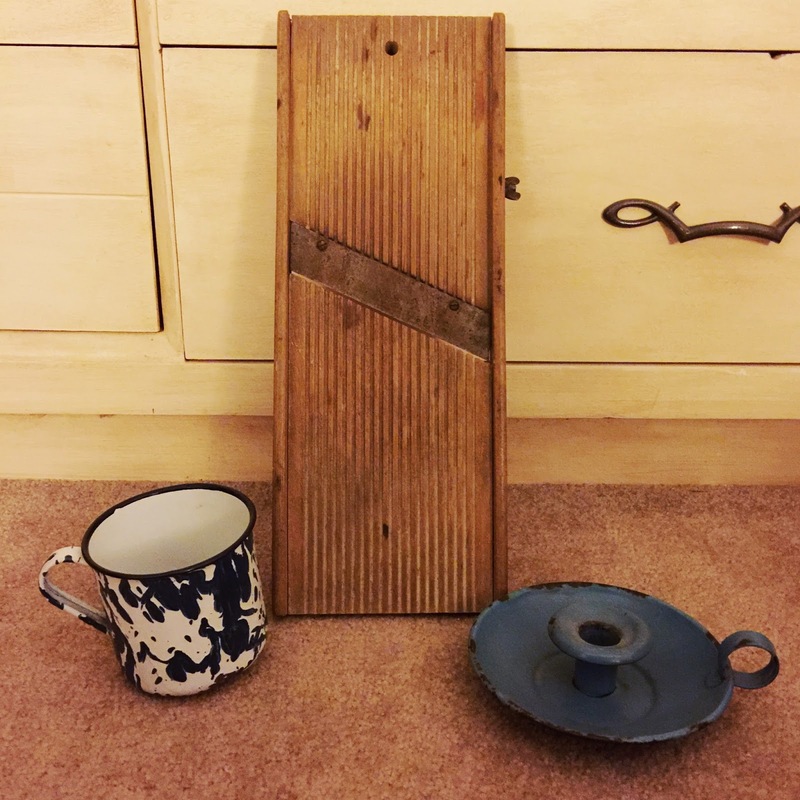 Some primitives... a kraut cutter, enamel mug, and enamel candle holder. I looked and looked for an enamel candle holder in a decent price range to use at my wedding as part of one of the centerpieces. 5 months afterwards, I finally get my wish. Not an auction buy... but an ebay buy. 75 vintage (1960s-70s) horse show ribbons. Thinking I'll re-list on ebay/etsy by color. Some may go to my booth. Here's a close up. The HUGE purple, red, and yellow one says Chesapeake Hospital Charity Show 1973. Weird/small world fact - I was born at Chesapeake Hospital (13 years later)... so I will probably keep that one. 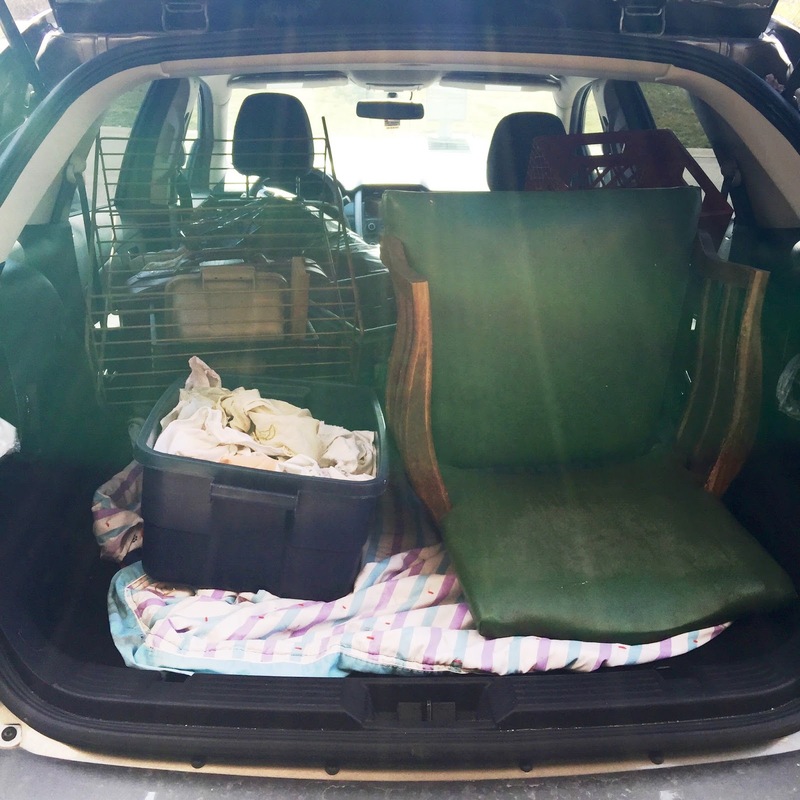 The rescued midcentury chair. It is going to be cleaned up vinyl cleaner, the legs will be sanded down, and re-stained in my favorite gel stain. I do not have a picture of the rescued cabinet. My friend loaded it into her moving truck and luckily being housed at her storage unit. I will pick it up soon and share it with you guys. I bought a whole bunch of feed/seed/grain/sugar/etc. sacks at the auction. They need a wash. Some are a little holey... but perfect for reupholstering a chair. 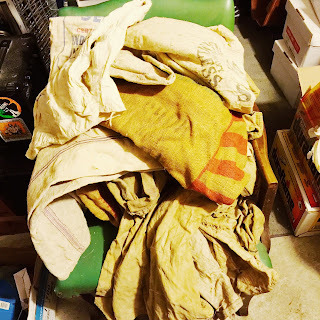 Love the pile of sacks. 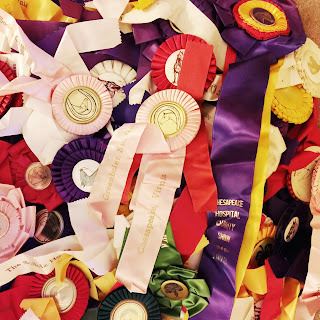 Horse show ribbons are very popular around here - especially pink! Great haul. That chair is AMAZING!!! Can't wait to see the finished product. What a load of vintage goodies. 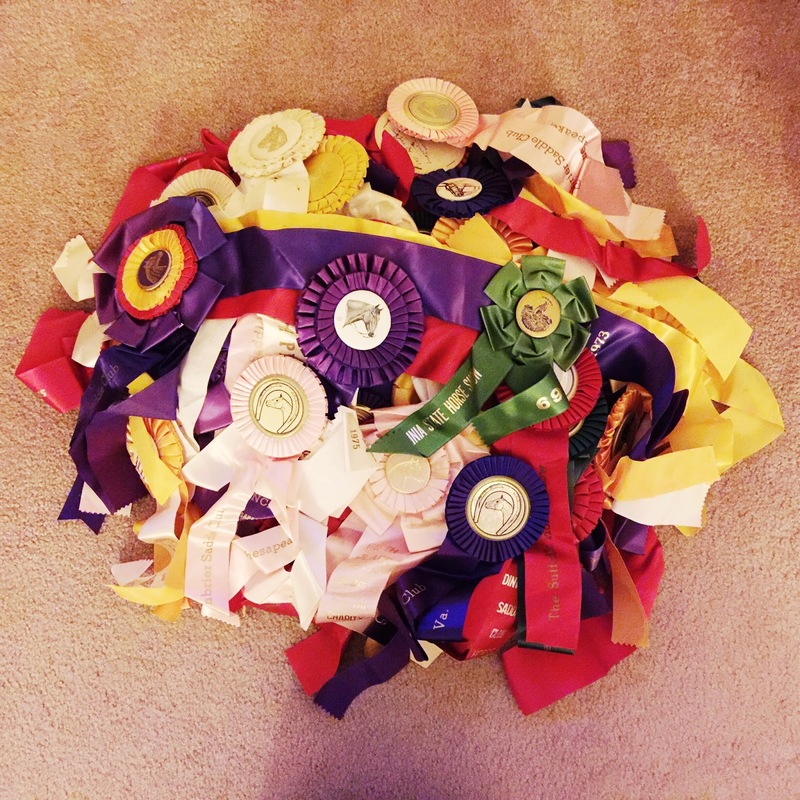 I think the ribbons and the sacks are my favorites. 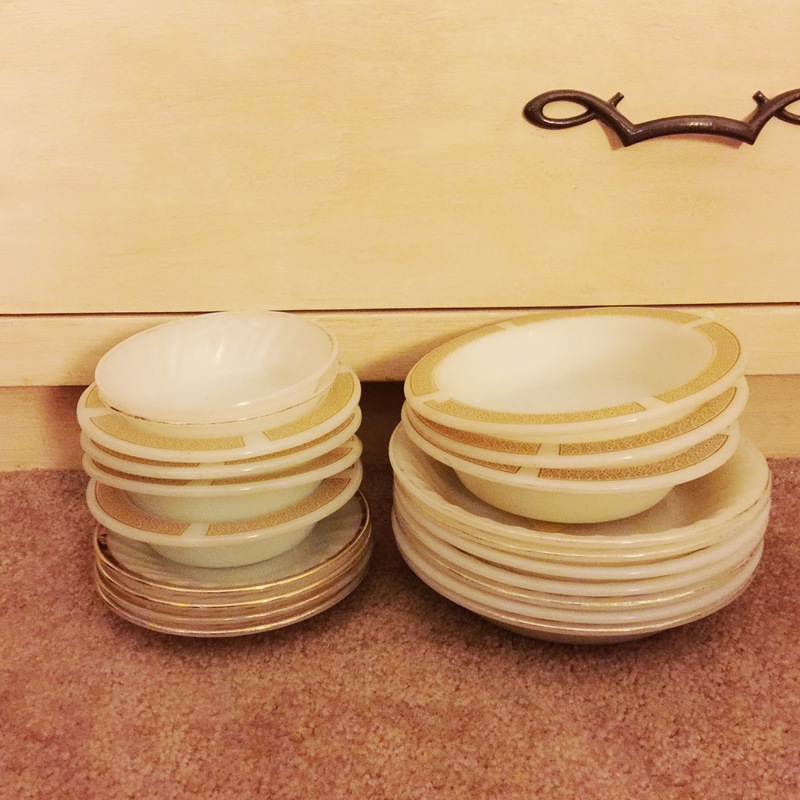 Thanks for sharing your haul with Talk of the Town. What a lot of fun finds. 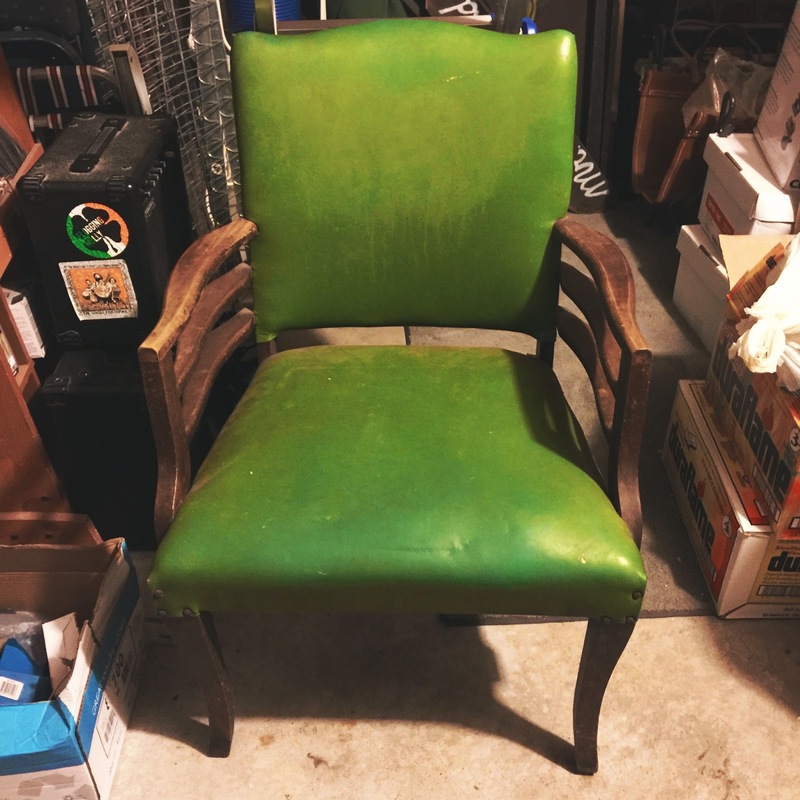 I can't wait to see what you do with the green chair. I love treasure hunting! Thanks for sharing with the Thursday Blog Hop! Amazing prices (and free!) on this week's buys, Melissa. 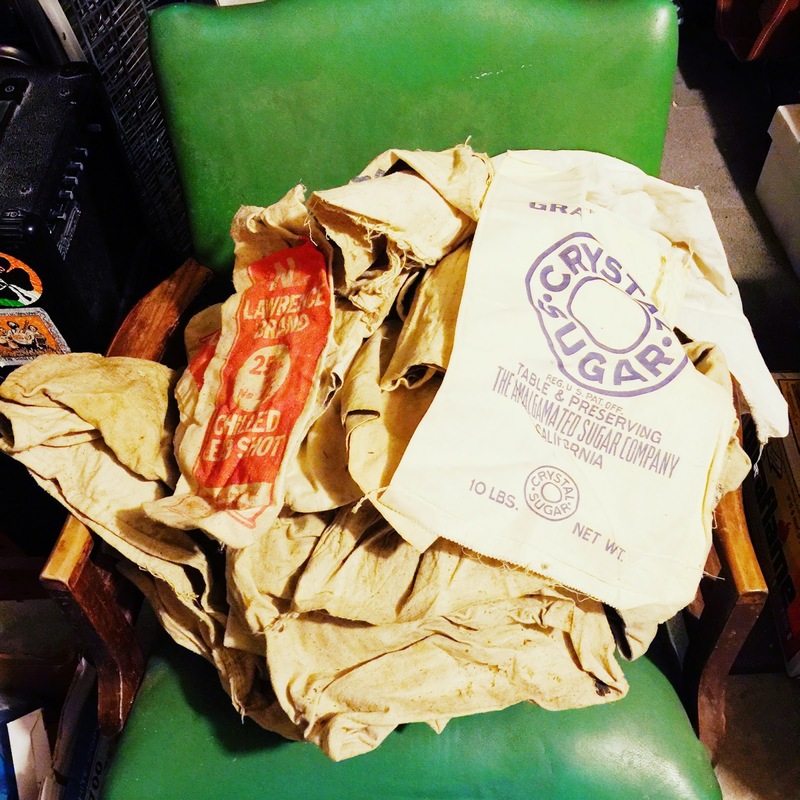 Love the enamelware, the chair, and the sacks. Thanks for linking up with Vintage Charm, and keep the McCoy!